GOLDEN VALLEY, Ariz. — In the wake of a number of Mohave County residents testing positive for heavy metal toxicity, a group has formed on Facebook to pursue a class-action lawsuit. Called “Chemtrail Geo-Engineering Lawsuit,” the approximately 300-member group is seeking more members who have tested positive for heavy metals in their blood and hair follicles, and those who have had tests conducted on rainwater and soil samples. At the time of this release, the group posted that a Bullhead City, Ariz., woman had just received test results showing the levels of barium in her blood were 28 times normal levels. “It has become painfully apparent that our federal government, state government and environmental agencies remain unwilling to properly investigate what is going on with the health of people,” said Al DiCicco, of Golden Valley, who has been among those spearheading efforts to get answers as to why he and at least a couple dozen others have tested positive for high levels of the elements barium, aluminum, strontium and uranium. The group discusses geo-engineering, which is a process used to manipulate the climate to counteract the effects of global warming from greenhouse gas emissions. DiCicco also has been in contact with documentary filmmaker Michael J. Murphy, whose film “What in the World are They Spraying?” explores the phenomenon of chemtrails. 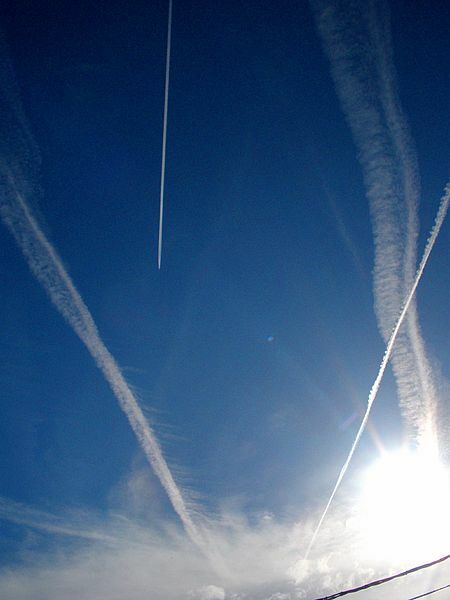 The film proposes that chemtrails are part of a geo-engineering program that uses jet planes to spray a solution into the atmosphere. The solution is said to contain barium, aluminum strontium and other elements, which are supposed to reflect sunlight and cool the planet. “I’m in contact with people all over the world who are well aware of the reality of geo-engineering, and the harm that is being done to humans, plants, food production and animals,” DiCicco said. Although it is admitted that geo-engineering is occurring, “there are still many who do not believe, refused to investigate, and failed to take any action whatsoever,” he said. The group is seeking a law firm to represent it in a class-action lawsuit. The Arizona Department of Environmental Quality, the Mohave County Department of Health, Arizona Gov. Jan Brewer, the Federal Aviation Administration, the Environmental Protection Agency and President Obama could be among the defendants. DiCicco said he encourages all to thoroughly investigate geo-engineering, and that anyone who is ill should insist their doctor conduct tests for heavy metal toxicity. – The author has dedicated the work to the public domain by waiving all of his or her rights to the work worldwide under copyright law, including all related and neighboring rights, to the extent allowed by law. You can copy, modify, distribute and perform the work, even for commercial purposes, all without asking permission. 2. 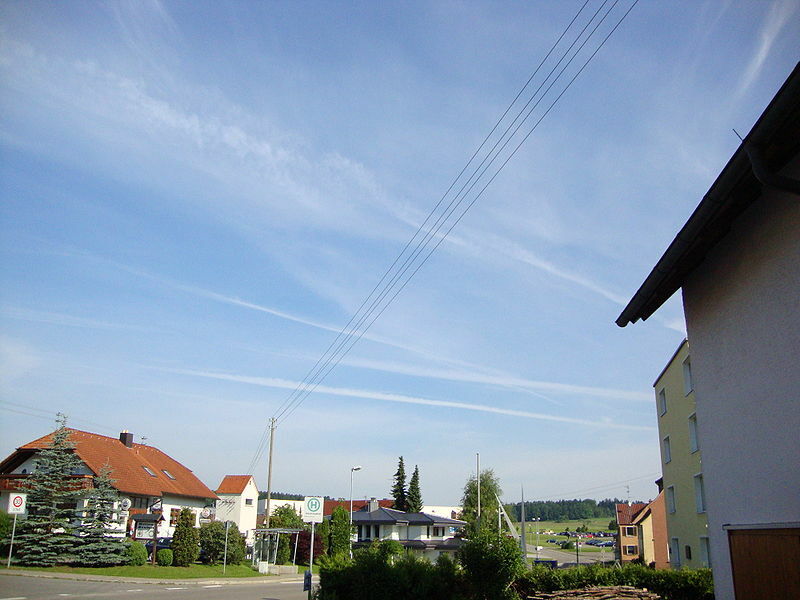 Chemtrails over Wellendingen, Germany – Massive spray attack, from the early morning till afternoon, by Captainoliver – I, the copyright holder of this work, release this work into the public domain. This applies worldwide. I grant anyone the right to use this work for any purpose, without any conditions, unless such conditions are required by law. The publishing of these images does not imply that the authors endorse this article. This entry was posted in Alternative Health, Environment, World News and tagged chemtrails, class-action lawsuit, crimes against humanity, geo-ingeneering, health, illness, responsibility by cnlib. Bookmark the permalink. Here is a recent video about laboratory testing in Florida on august 2011. It is self explanatory. People have to take legal actions to identify who are behind this real terrorist plot against humanity and take legal actions to stop this insanity.